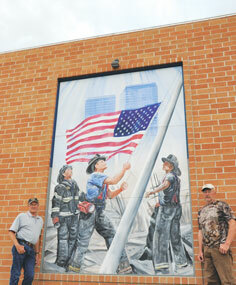 Lovell Fire Chief Jim Minchow (left) and Captain Bob Mangus pose next to the 9/11 firemen’s memorial mural on the side of the Lovell Fire Hall addition, which was under construction when the World Trade Center was attacked 10 years ago. Remembering 9/11. Newspaper In Education feature with local comments.